Pixels kicks off in the Summer of 1982, as the golden age of video gaming is drawing to a close. Home consoles like the Atari 2600 and 5200 were generating billions of dollars in sales with popular titles like Asteroids keeping players entertained in the comfort of their own lounge rooms. Meanwhile a video game arcade was still THE place to be for teens, showing off their skills on games like Pac-Man, Q*bert and Donkey Kong Jr.
Sam Brenner is 13 and competing in the Arcade Game World Championships, where he narrowly misses out on being crowned World Champion of Donkey Kong, after losing to Eddie Plant in an intense competition. Fast-forward to the present day and Sam (played by Adam Sandler) works as a home theatre installation technician. His old gaming compadre and best friend Will Cooper (Kevin James) nowadays just happens to be the President of the USA. A handy connection to have when alien forces misinterpret video game content within a time capsule fired into space back in ‘82 as a declaration of war, and commences an invasion of Earth. Thankfully Brenner and his posse of old school gaming mates from back in the day are on hand to fight off these intergalactic villains and save the world from certain doom. It’s a ridiculous premise and one that grows more ridiculous as the film plays on, but surprisingly it is also consistently entertaining. Perhaps it speaks to my inner self when lines like “I’m just a loser who is good at old video games” is enough to bring a smile to my face. 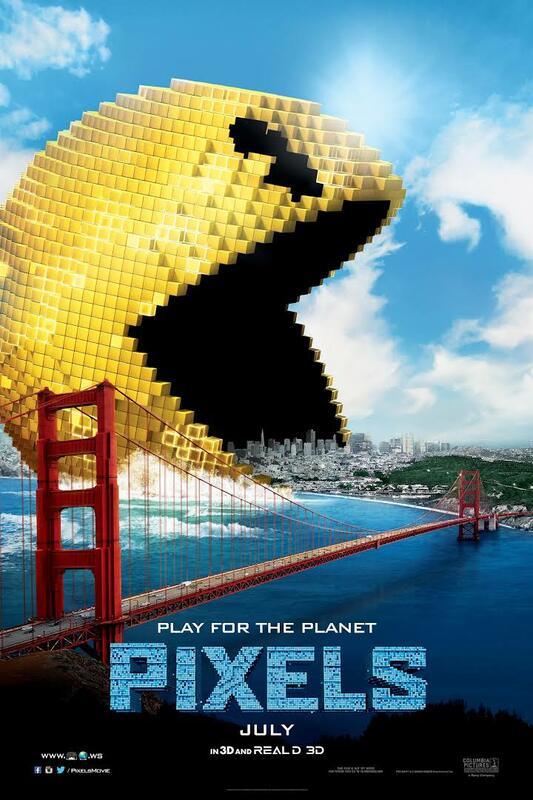 Pixels is a kaleidoscopic cacophony of colourful comedy and despite its thoroughly clichéd proceedings, scores high with me for its visual effects and shameless procession of pop culture related jokes, as well as star studded cameos incorporating faces from Game of Thrones, 30 Rock and more. It’s a film primarily for nostalgists of an era where 8-bit games were just the beginning of our love affair with technology, and for fans of films like Ghostbusters, Wreck-It-Ralph, Tron and the King of Kong. If you can surrender to the ridiculous you’ll enjoy this adult nerd fantasy.